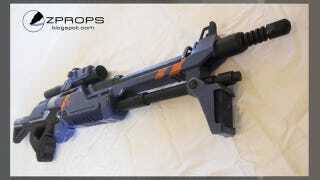 Prop builder Zander Brandt figured the world was short on replica M-29 Incisor rifles from Mass Effect 2. So he went and made one. The Incisor is one of the sniper rifles available in the game, and for most of it was my go-to weapon; it's the one that fires three shots at once. Most of the gun is made from wood, meticulously carved and then sanded before being painted to achieve the metallic look. The cosplayer who commissioned the gun is going to be very happy with the end product.